Retrieve the Ring of the Erudite and the Ring of The Beast. 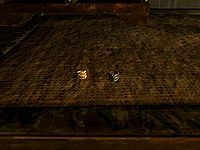 Speak with Feran Sadri in Volkihar Keep, who sends you to retrieve two ancient vampiric rings, the Ring of the Erudite and the Ring of The Beast. The rings are held by two leveled targets in two random locations. After retrieving the rings, return to the castle to receive your reward (you get to keep the rings). If a previously slain enemy is chosen as a bearer of one of the rings, or a previously cleared dungeon is chosen as the destination, it may be impossible to complete as the body may have disappeared, meaning the ring cannot be obtained. Reload a save made before receiving the mission from Feran Sadri, and then initiate the quest again to be assigned different ring locations. Add the missing ring via console to the inventory player.addItem ITEM_ID 1 (where ITEM_ID can be looked up like this: help "Ring of the Beast"). Advance the quest stage via console. Try stages 10, 110, 120 (e.g. command setstage DLC1RV08 110). If this works as intended and both rings are in your possession, you should be able to report back to Feran. The location given for finding one of the rings may be the Katariah. The ship does not arrive until the Hail Sithis quest, rendering the ring unattainable until you have reached that point of the Dark Brotherhood questline. Thus if you choose to destroy the Dark Brotherhood, the ring becomes unattainable. Sometimes the random leveled NPC chosen to hold the ring will be an essential character. In this case, the only way to obtain the ring is to pickpocket it from them. 10 Feran Sadri has sent me to retrieve the Rings of Blood Magic. 255 Finishes quest I have retrieved the Rings of Blood Magic. The following empty quest stages were omitted from the table: 110, 120. On the PC, it is possible to use the console to advance through the quest by entering setstage DLC1RV08 stage, where stage is the number of the stage you wish to complete. It is not possible to un-complete (i.e. go back) quest stages, but it is possible to clear all stages of the quest using resetquest DLC1RV08.